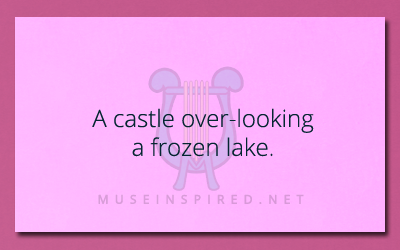 Describe the Setting – Castle over-looking a frozen lake. A frozen lake castle… There it is, a castle sitting above the lake. What sort of setting does this invoke? I may have watched Frozen one too many times, but I’ve often seen beautiful artwork of castles over-looking the waters of a lake or ocean. For this setting challenge, image the castle is standing over the bank of a frozen lake. What sort of home or fortress might this be? Is it in a modern setting or in a fantasy world? What about on another planet and discovered by space explorers? Who lives in this castle and what sort of kingdom does it reside in? What might you find inside, or in the area surrounding it? For a little visual inspiration, this Pinboard offers thousands of real life castles or you can take a look at this great collection of castle artwork.